The Adventurers Cool Hat provides ultimate cooling and protection from the sun. The Adventurers Cool Hat provides ultimate cooling and protection from the sun. This hat is ideal for a variety of outdoor activities keeping you covered from every angle not matter what Mothers Nature throws at you. This comfortable hat is ideal to beat the heat and cool you down for any adventure whether that be camping, bushwalking, line dancing, fishing, canoeing, running, horse riding, kicking back by the pool, golfing, playing tennis, lawn bowls or cricket, cycling, lawn mowing, ...anything that takes you outdoors. By cooling the carotid artery that runs to your brain up the back of your neck, your body cools down. This unique hat has a series of cool tubes, filled with cooling crystals, in the back flap. Immerse the flap in water and these cool tubes are activated. It is like having a series of vertical cool tubes running right down the back of your neck. Add to this the airflow crown, the Cool Pad inserted into the top of the crown, and the terry toweling sweat band ...and you have the coolest hat available today. MS or migraine sufferers, women going through change of life or cancer patients receiving radiotherapy treatment find the Adventurers Cool Hat useful. 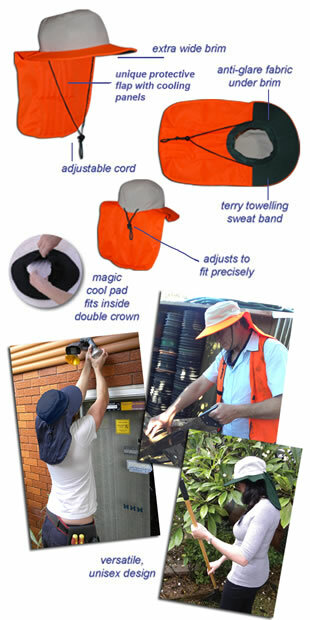 The Adventurers Cool Hat is the perfect choice for outdoor workers to reduce heat stress. Heat stress is the effect of heat on the body and can be very dangerous. This Australian designed hat protects you in a number of vital ways. Wide front brim to protect your face yet keep your vision unhindered. Wide front brim holds its shape perfectly. Wide brim extends halfway around the circumference but does not interfere with your peripheral vision. Rear Cool Flap loosely drapes over your neck to keep you shaded no matter how you move. Inserted into the Cool Flap are cool sections that form cooling crystal tubes when placed in water. They work to cool you like a cool neck wrapextending down your back, not just around your neck. Cool Flap means you can comfortably sit in your vehicle without the back of your hat hitting the seat. Dark colored underside offers anti-glare protection to aid visibility. If you are finished using the Adventurers Cool Hat, hang it up. Do not store your Adventurers Cool Hat scrunched up while damp, as this can cause mildew.